HP Umpire Stu Scheurwater ejected Mets Manager Mickey Callaway (batter's failure to attempt to avoid being hit by a pitch; QOCY) in the top of the 6th inning of the Mets-Braves game. With one out and one on (R1), Mets batter Brandon Nimmo took a 2-1 curveball from Braves pitcher Jesse Biddle for a called third ball; despite the pitch touching Nimmo, HP Umpire Scheurwater ordered Nimmo remain at-bat pursuant to Rule 5.05(b)(2)(B). Replays indicate Nimmo made no attempt to avoid being touched by the ball, the call was correct. * At the time of the ejection, the Braves were leading, 1-0. The Braves ultimately won the contest, 8-2. This is Stu Scheurwater (85)'s first ejection of 2018. Stu Scheurwater now has 8 points in the UEFL Standings (4 Prev + 2 MLB + 2 Correct Call = 8). Crew Chief Gary Cederstrom now has 8 points in Crew Division (7 Previous + 1 Correct Call = 8). *Official Baseball Rule 5.05(b)(2) states, "The batter becomes a runner and is entitled to first base without liability to be put out when—He is touched by a pitched ball which he is not attempting to hit unless (A) The ball is in the strike zone when it touches the batter, or (B) The batter makes no attempt to avoid being touched by the ball." *When a pitched ball touches the batter in the strike zone, the ball is dead and the pitch is declared a strike. *When a pitched ball touches the batter outside of the strike zone, and the batter makes no attempt to avoid being touched by the ball, the ball is dead and the pitch is declared a ball. This is the 58th ejection report of the 2018 MLB regular season. This is the 25th Manager ejection of 2018. This is New York-NL's 2nd ejection of 2018, T-2nd in the NL East (WAS 3; ATL, NYM 2; MIA, PHI 0). 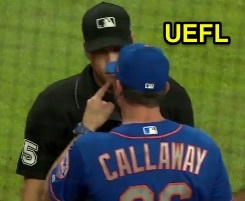 This is Mickey Callaway's first ejection since August 3, 2016 (Fieldin Culbreth; QOC = N-C [Replay Review]). This is Stu Scheurwater's first ejection since August 16, 2017 (Scott Servais; QOC = N [Check Swing]).